After making history as the first Indian woman to win a medal at the Paralympics, Deepa Malik continued to strive for higher challenges – be it riding the highest motorable roads of Ladakh or diving into swimming and car rallying. Today, she straddles multiple roles as an athlete, trainer, motivational speaker (for the world) and wife, mother, caretaker (at home). We talked to her to see what makes her tick and how she manages to #BalanceforBetter. Q. A mother of two, Paralympic silver-medallist, role model, biker and adventure enthusiast, – you juggle many different roles efficiently. What’s your secret? A. There’s no secret really – just love what you do. I’m very passionate about all these activities, be it biking, car rallying, or sports. These have helped me reclaim my life. So, along with passion, there is a feeling of gratitude. I feel nice when I do these activities. And when you love something so much, you always find time for it. Q. Which of these roles is the closest to your heart and why? A. I think the word “role model” may be a bit ostentatious, but what it really means is that you are impacting society, shaping mindsets, and bringing a change. And that’s closest to my heart. As Gandhi said, “Be the change you want to see in this world”. My journey of “ability beyond disability” is my way of creating positive impact by proving that with the right opportunities, people with disabilities can also be achievers. Anything that adds to the value of this mission and in turn changes the outlook of the society towards being more inclusive and accepting is what I love to do. Q. In your talks, you speak about challenging the ideas of beauty. What are some of the stereotypes you have fought? And what has helped you face them? A. I have seen women with disabilities often referred to as “patients” and rarely as “beautiful” – because we are infected by a stereotype definition of beauty. We think “beauty” is perfection, but I think it’s something that comes from within. I have come to learn that people look at you the way you look at yourself. I have never let any medical problems stop me from feeling beautiful. I have followed fashion trends and even created my own fashion to suit the clothing challenges of my physical disability. I love to dress up, and buy shoes even though I don’t walk. People even call me a “fashion icon” today. And I think that’s the way to fight stereotypes, by creating your definitions. I think anything which is happy and exudes positivity, and can make you smile, be it living or non-living, is a product of beauty. Q. What keeps you motivated, despite the constant demands on your body and mind? A. Motivation is like eating food thrice a day. You can’t motivate yourself once and think it will last forever. So, I feed myself motivation, every single day and many times a day. I look out for role models and things that would rejuvenate and inspire me. I’m always hungry for in inspiration. I read quotes and books. I let people touch my life and inspire me. Most importantly, I allow myself to get inspired. The problem with many people today is that they think they know it all. You need to be open to learn and be motivated. Q. What are the two things you balance, every single day? Be it physically, mentally or emotionally. A. The working woman and the family woman. I am a mother, wife and homemaker, and when I go out and follow my passions, it takes up a lot of family time. I prioritise the days that are important to my family and this has helped me become an expert in time management and planning. Yet, there are times when you can’t be there for your family, and it can take a lot to get over the guilt. But then you look at the larger picture, and your family comes and tells you that you’re doing a good job, and you see the impact you’re making, and that’s my motivation. I also balance my personal work with the work that’s been bestowed on me. My foundation and social work need to be balanced with competitions and trainings, and there’s quite a tussle there, because one journey is of personal gain and the other is of reaching out to people. I get emotionally torn at times, but I try to balance both, and that for me is “BalanceforBetter. As women, I think we must not let ourselves be surrounded by guilt and we should realise that we can’t do everything at once. We need to choose and prioritise, and follow our choices with all hearts. As long as we are happy doing what we are doing, everything is fine and the balance is perfect. When we talk about battling all odds and emerging a winner, Deepa Malik stands as a living testament. She proved that no matter how strong the opposition, sheer courage and will power can make one a true winner. And with that attitude, she scripted history by winning the silver medal in the women’s shotput F53 event at the Rio Paralympics, with a personal best throw of 4.61m! This win at Rio makes her India’s first woman and oldest athlete to ever win a medal at the Paralympics. Recently, Deepa continued her winning streak by bagging her second bronze at the Asian Para Games, for women’s F51/52/53s discus throw. She is currently world No. 1 in the F-53 Javelin throw category with a Gold at the Para Athletic Grand Prix 2018. Deepa is also the President’s role model and NITI Aayog award winner for women transforming India. And was conferred the prestigious Padma Shri Award by the Government of India, in 2017. After being diagnosed with a spinal tumour, Deepa was left paralysed from chest down during a procedure to remove the same. Instead of letting it come in her way, this only contributed to spurring her on to do something that beats the prejudices that society holds for women or the specially-abled. 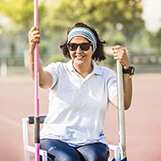 She took to sports at the age of 36, a point where most accomplished athletes seek retirement from their respective disciplines and went on to set the benchmark across various sports in the paraplegic arena. She was awarded the Arjuna award, the highest honour for a sportsperson in India, in 2012 for her achievements. From braving three surgeries over the past 15 years to becoming the first paraplegic Indian woman biker, swimmer, rally driver, entrepreneur and a motivational speaker; this all-rounder has proved her to be a winner in every right! Her focus, determination and attitude are something few people can dream of. From junior to senior executives, everyone finds her sessions motivating and inspiring, teaching people to fight odds and never settle.